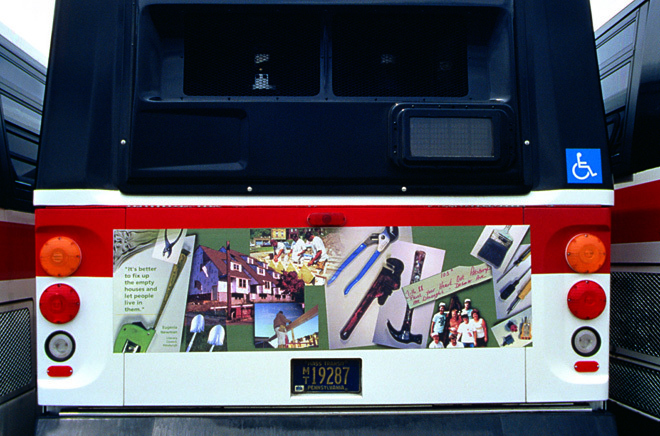 “End of the Line: Building Bridges with Pittsburgh’s Busways” (1996-1997) was a community-based public artwork and collaboration by Lisa Link and Carolyn Speranza. In their examination of historic as well as contemporary issues in Pittsburgh communities, the artists held workshops at neighborhood Carnegie libraries. Four common themes surfaced from participants’ oral histories, photographs and photo-montages: The Unsung Hero, Urban Removal, Rebuilding Our Neighborhoods and Community Gardening. Digitally collaged artwork was created from these themes, printed on vinyl and displayed on a fleet of city buses, driving their routes throughout Allegheny County. End of the Line toured Russia in the “Engaging the Urban Environment” exhibition at the Centers for Contemporary Art in St. Petersburg, Nizhny Novgorod, and Moscow. The project was published in theorist Malcolm Mile’s book, Uses of Decoration: Essays in the Architectural Everyday. Funding for this project was given by the National Endowment for the Arts New Forms program. End of the Line drew additional support from Allegheny County Port Authority, 3 Rivers Connect, the Carnegie Libraries and Internet Services Corporation.